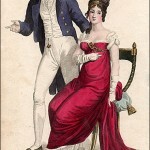 La Belle Assemblée, April 1809. 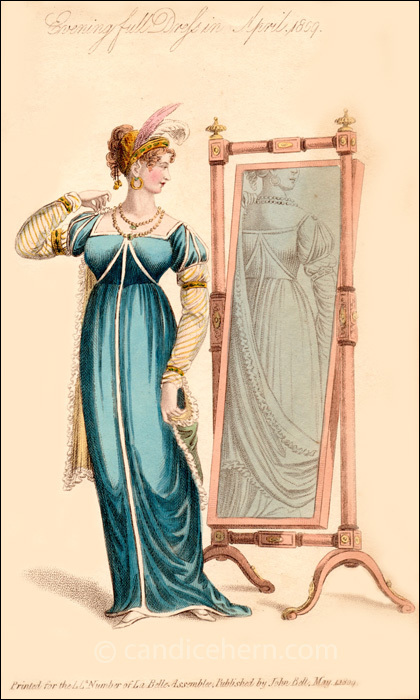 This print is unique in its depiction of a woman in front of a mirror. 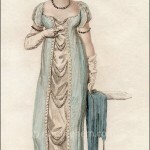 There are a few early French prints with a similar pose and mirror, but it is rare to find one in a British publication. 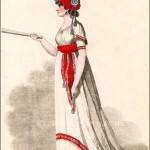 Note the hoop earrings, which always look so modern to me but are frequently shown in fashion prints of the period. Also note the bracelets on the wrists and upper arms. Bracelets were almost always shown in pairs, ie no single bracelet on one wrist, but matching bracelets on each wrist or upper arm.